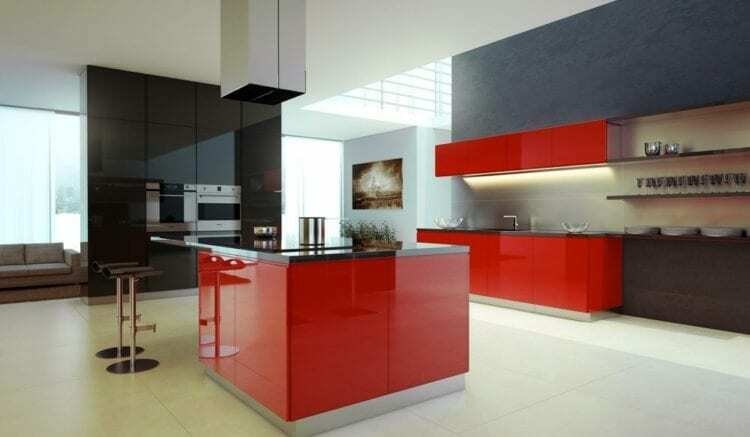 FeastHome – Red kitchen color is the tone that shines with sensuality and passion. It’s a romantic color that can go well in any room including the kitchen. It’s got a bold, striking color to spread the warm feeling all over the room. There’s a wide range of hues when dealing with the color of red which make it versatile. 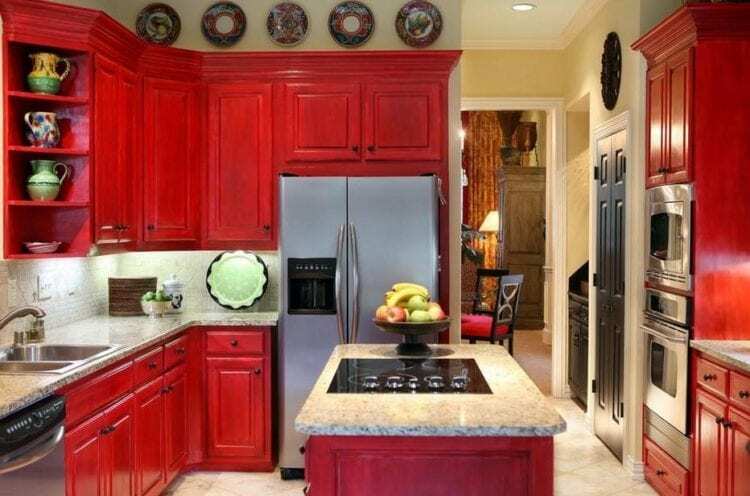 Red is the color you may want to have in your kitchen. It could make a good impact and create drama instantly. This classic color represents passion, power, love, and even danger. However, it can also be associated with food such as strawberries, tomatoes, pasta sauce, and more which would increase the appetite. That’s what makes it perfect for your kitchen. 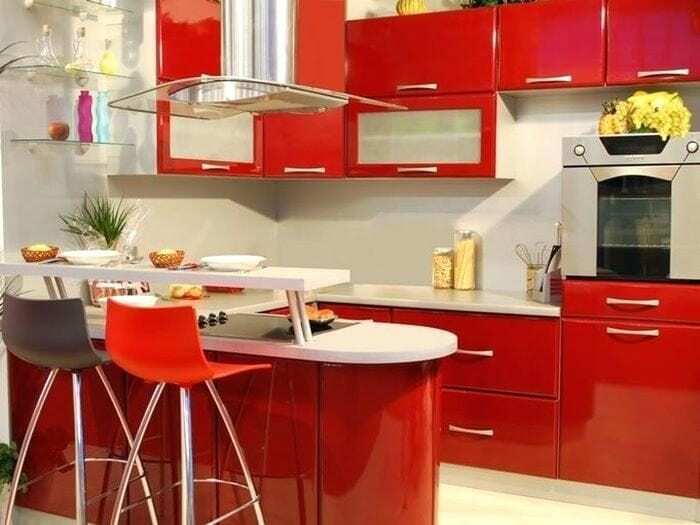 Let’s explore these colors red kitchen ideas to design a romantic and passionate room for your cooking. 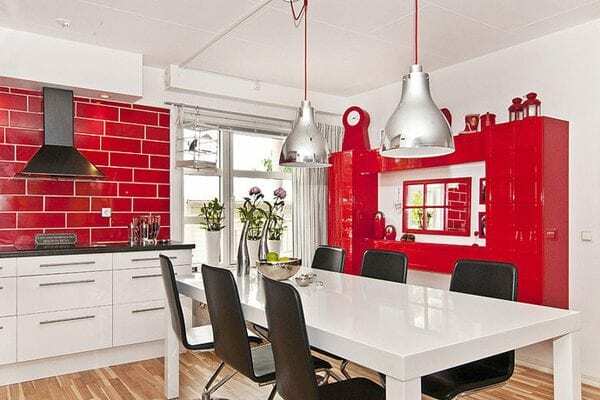 The saturated red walls are a real showstopper of this kitchen design atmosphere. If you think that red element is a tile backsplash, you’re wrong. That wall space between the cabinet is painted red. In order to get a shiny touch, the designer covered all the wall space with glass panels. The good thing about the glass panels is because it’s easy to clean. Some type of plastic materials is quite strong and flexible. It can make a great touch to your modern kitchen. What people like about this material is its affordability and ease of clean. It’s easy to get the cabinet clean and shiny. 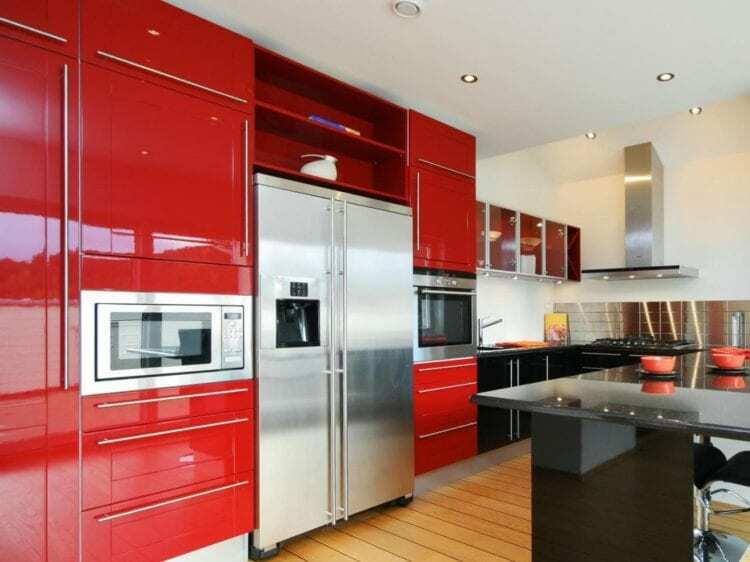 Pairing the color of red with stainless steel charm from the fridge and oven is really matching because they have the same impressive shine effect. That industrial style kitchen island how a built-in sink to let the cooking flow going smoothly in your kitchen. The stainless steel countertop is for easy cleaning. You can always have a clean counter every time. The rustic red shade in this kitchen plays an important role to keep the impressive charm. Check out the luxurious redwood cabinets in this kitchen. 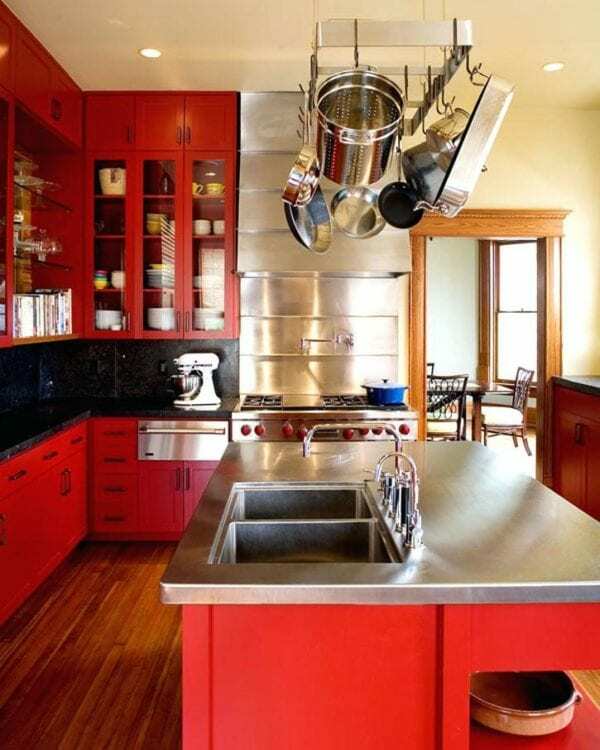 Almost the whole space in this kitchen filled with red. The bold hue from the cabinet is so dominating. 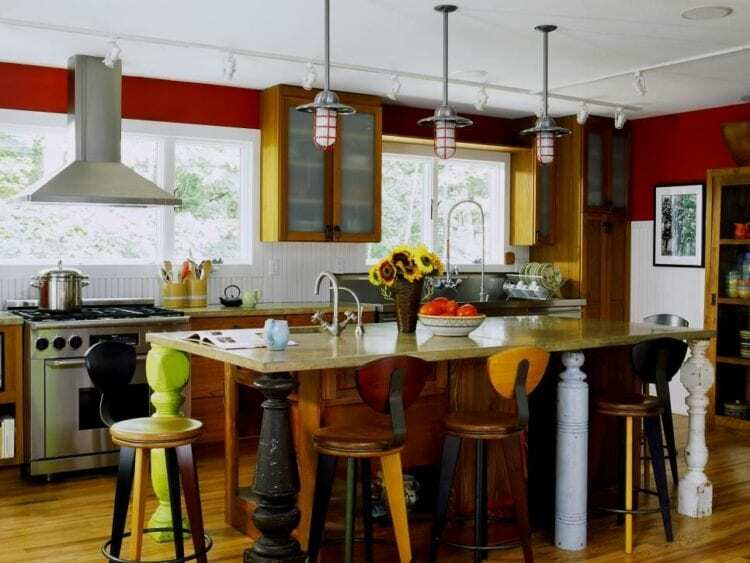 However, it’s still acceptable because of the white ceiling, reddish flooring, and black countertop to balance the red. 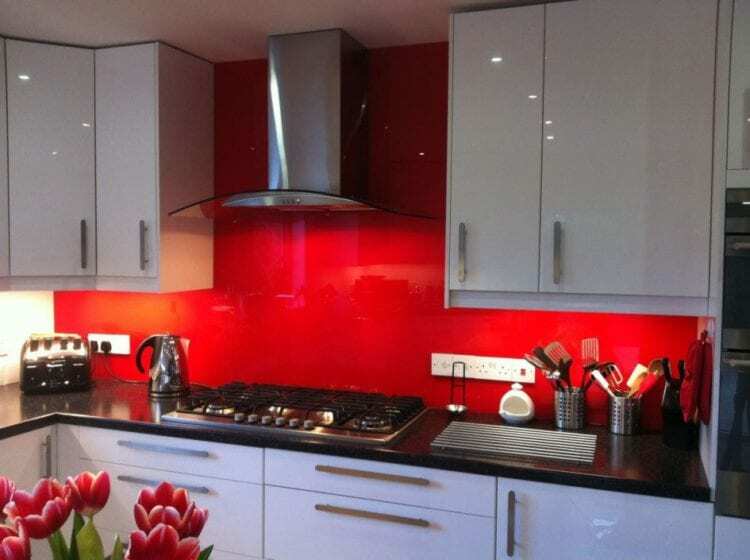 The combination of red, black, and white looks fantastic in the kitchen. These classic and vibrant colors are so well blended. It gives a sophisticated elegance to the cooking space. It would offer an energetic atmosphere to the room. It’s also visually captivating. It can adapt to the style you have in your house. 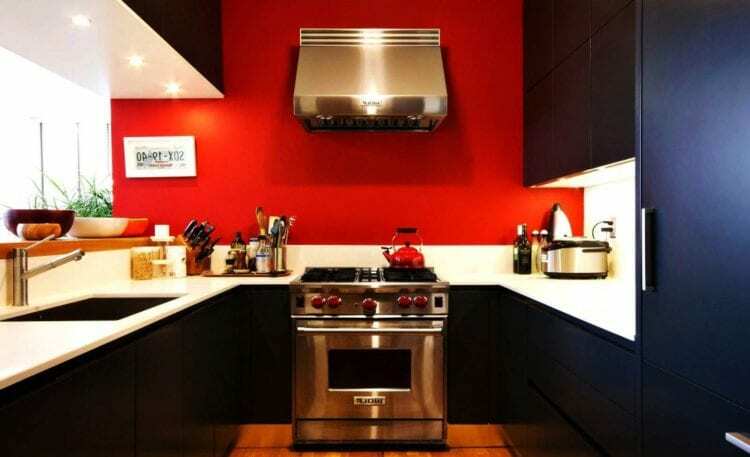 Both red and black color in this kitchen fulfills the color that this white kitchen needs. Some elements of black are applied functionally. 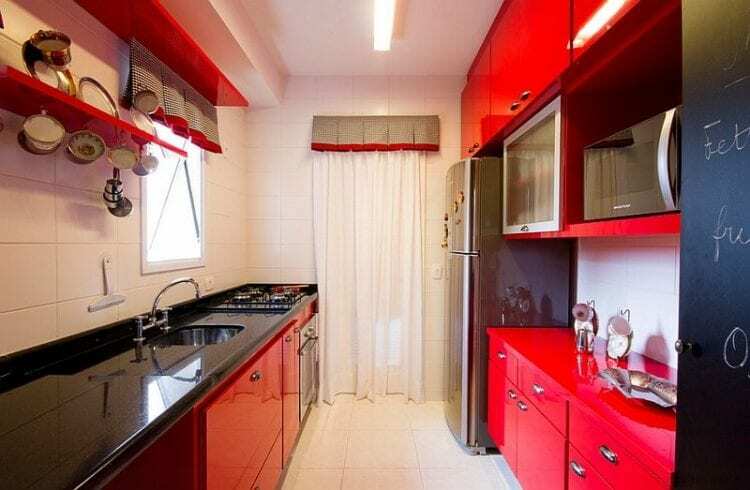 The red elements in this kitchen are more for decoration. It’s got a perfect amount of brightness too. Some cafe vibes in this retro kitchen are provided by the unique, retro chair and that chalkboard on the cabinet. These two elements are not that large in size, but it makes a big impact on the whole style of the kitchen. Having a well-organized kitchen is the dream of many homeowners. It’s something you really need when you have a kitchen with limited space like this one. The organization is the key to an efficient kitchen design. 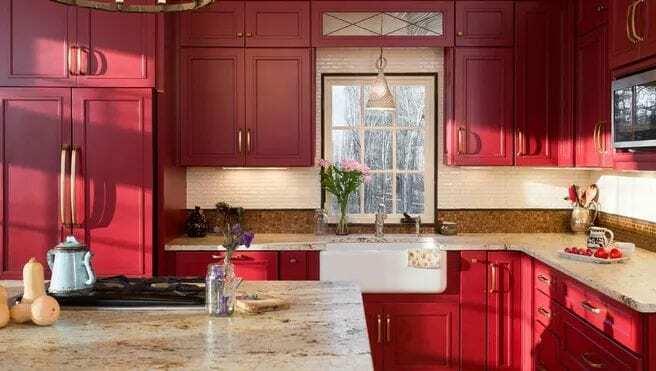 Combine that wooden red kitchen cabinet with the beautiful marble countertop. It’s important to have a bright color exists in between the bold color like red. Such natural touch from the marble material brings out the balance and elegance of this small kitchen. A red farmhouse kitchen in a hot summer is an astonishing combination. 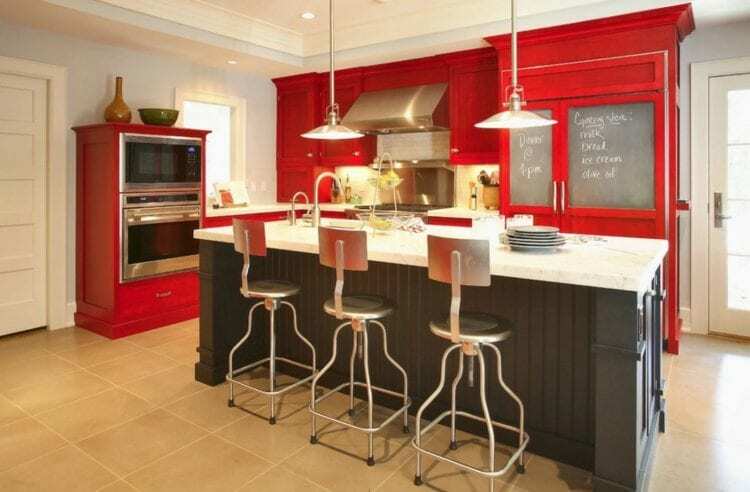 The sunlight during the day would create a dramatic effect on your red farmhouse kitchen. The natural pattern from marble countertop plays an important part to provide texture to this country kitchen. As you can see, the red wall between the cabinet really supports the plain white color. Without the red color, this cabinet won’t be so attractive. The black color stands in the middle of the situation to create balance. This contemporary kitchen looks really cozy. It’s because each of the colors has its own charm to cover enough portion in the kitchen. The eclectic combination showcases against the welcoming red walls. The wood material of this cabinet came from almond trees. It means the quality and strength can’t be questioned. You can pair the red rustic wood color with some antique and ethnic accessories to make it more alive. Combining such contrasting style might be impossible for some people. Well, that’s not the case for this small modern kitchen. 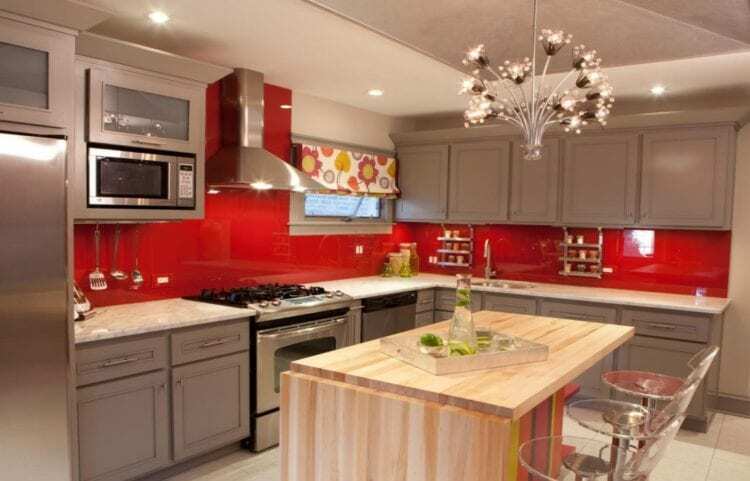 The retro red color works really well in this modern kitchen. Pairing it up with grey shades make the impossible to be possible. Blending such bold color like red with a dark color like black is a risky move. But, if you are brave enough to create something new, you’ll achieve a fantastic result like this one. I guess, you just have to be smart in deciding what another color to choose for the balance. 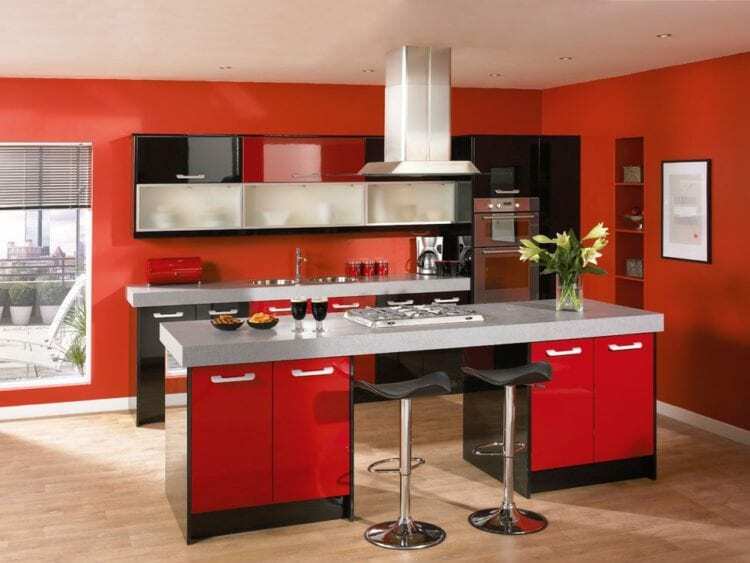 It’s a black and white kitchen that has a very wide space which is accentuated by the colors of red. 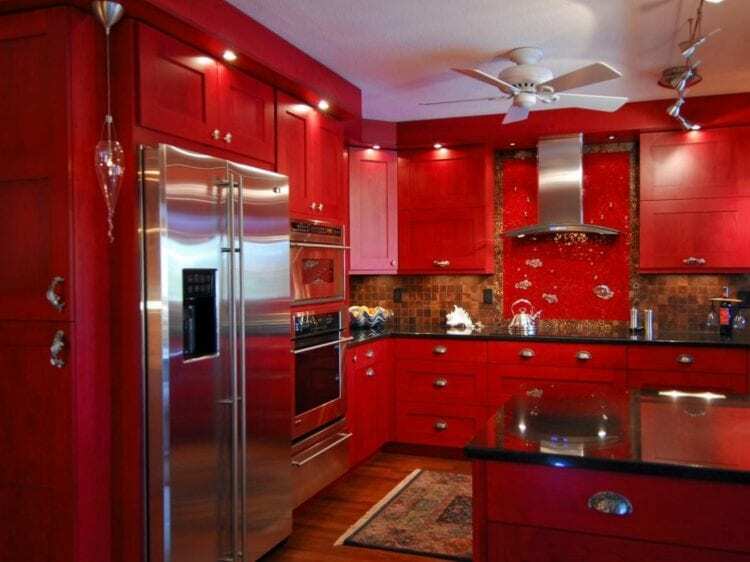 One element of red is ready to shine as the center of the kitchen. The distance between the cooking space and the kitchen island is quite far for a normal kitchen. If you are looking for a great color scheme for a small kitchen, many people would recommend something bright to make a space illusion. However, there’s nothing wrong about choosing the dark scheme like this small kitchen. As long as you like it and you know how to handle it, it would be okay. 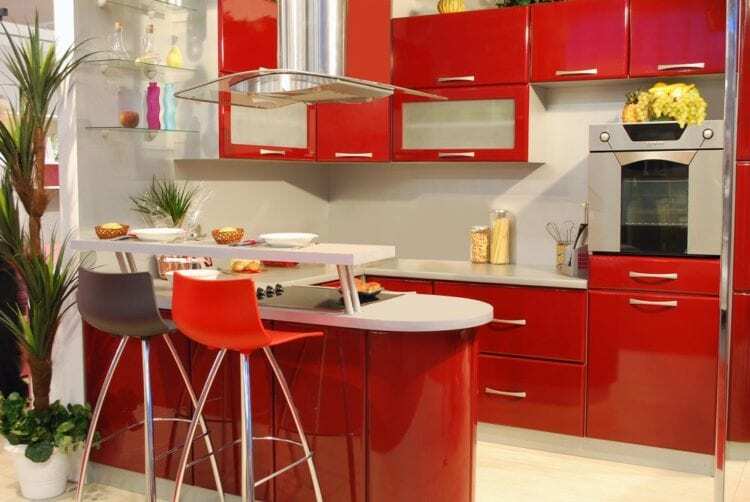 Those 17 ideas of the kitchen with colors red would surely catch a lot of attention when you have it in your own kitchen. Choose one that’s closest to your taste.